SUBHEAD: Ways to live off grid on less watts is a necessity for almost all but the largest PV systems. 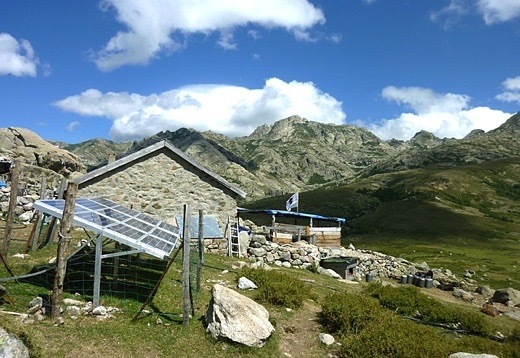 Image above: An off grid home requires a different more attentive lifestyle than living on grid. From original article. How often do you take electricity for granted? If you are like I once was, it happens quite frequently. Often, I would shut off lights and unplug things when not in use, but I still never really took the time to think about what it would be like to go without power — that is, until I spent more than two weeks after a hurricane in just that situation. I didn’t like it at first, but after a while, it was kind of nice to read with a lantern by my bed or work hard while the sun was up and relax once it retired. I figured it must have been kind of like how life had been for my great-grandparents at one time. I eventually did get into a routine, and it was at this time that I realized just how much the availability of electricity set the tone of my life. Just last year I had the amazing opportunity to spend several months off the grid in a very remote location. Although the home I rented had a well-appointed solar system and a back-up generator, there were still some things that I had to “get used to.” It took some time to develop a good working relationship with the solar system, and I prided myself on using the generator as infrequently as possible. Of course, the amazing thing about going solar is that you can make your system as large as you desire. For me, though, there was some adventure to working with the system that was in place and having to adjust to the solar power rather than taking power for granted. For example, vacuuming was something that was reserved for days when there was ample sun and backup power. We did quite a few things differently while we learned to live on fewer watts, and our off-grid experience was richer for the thought we had to put into preserving the free power from the sun. We never took a shower before the sun was up. We never took a shower when the sun was down. We only did laundry between 11 a.m. and 2 p.m., and only one load per day. We went to bed early and got up early (this proved to be most productive). We used battery-operated lanterns and book lights for evening reading. We unplugged everything — the coffee pot, the toaster, etc. – when not in use. We rarely used the microwave. We never left the TV on, and we used it sparingly. I think the nicest thing about living on fewer watts is just the lifestyle that it dictates. You become much closer to nature and the rising and setting of the sun and much more aware of your surroundings. I am convinced that the time living fully off-grid made me a more resourceful person, and I am anxiously awaiting another opportunity to leave the grid behind again!